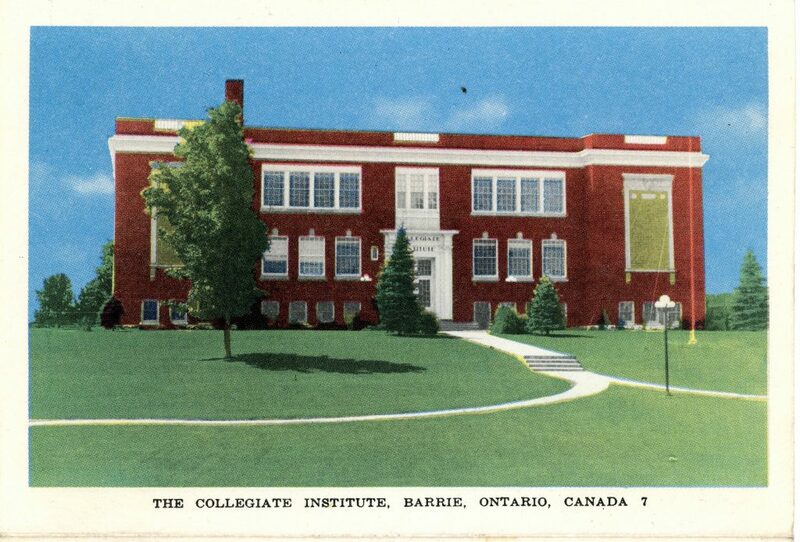 Souvenir of Barrie Postcard Collection showing Barrie Central Collegiate on Bradford Street. Home/Souvenir of Barrie Postcard Collection showing Barrie Central Collegiate on Bradford Street. Tags: Barrie Central Collegiate, Bradford Street, Postcard, School. Order this piece as a single 8"x10" print with a license for personal use. Order this piece as a single 11"x14" print with a license for personal use. Order this piece as a single 16"x20" print with a license for personal use. The printed piece that is delivered cannot be used in a commercial setting. Shipping is FREE! Print orders are fulfilled and shipped using Canada Post or FedEx within two business days. We only ship to Canadian addresses. The delivery date is subject to courier's estimate. Local businesses can license BHA images for advertising purposes, and therefore they could create profit from the use of those images for their businesses. Businesses can use this BHA piece to enhance their environment for their patrons to enjoy, or they can be used in website, social media, or print advertising. Our rates greatly depend on length of time that the piece is used to advertise, and the region in which it is being displayed. Contact our team to share your project ideas and get started on licensing this archive piece for your business.